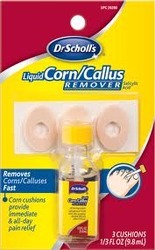 Dr. Scholl's Liquid Corn/Callus Remover features a medicated liquid that safely and effectively removes corns and calluses — while the self-stick adhesive cushion provides immediate and all-day pain relief. APPLICATION It is used for the effective treatment of corns. Description: DIVO dual action Callus Remover is perfect for removal of dry dead skin, corns and calluses. Say goodbye to rough, dry, callused feet with the new, battery-powered Ped Egg Power. Precision engineered, it features the new Nano Abrasion Roller that spins 2, 500 times per minute to buff away calluses and dead skin so your feet will be smooth and beautiful. Bonus smoothing head included. Requires 2 "AA" batteries (sold separately). Approximately 6" long. Velvet Soft Electronic Pedicure Foot File and Callus Remover and four AA batteries (not included) Gentle on your feet and easy to use, the Velvet Soft Electronic Foot File quickly helps you achieve soft, silky feet. Owing to the rich industrial experience and expertise in this business, we are involved in providing Cordless Electric Callus Remover. nickel callus remover will allow you to have beautiful, healthy and shiny feet and hands. Suitable for every skin type. » made of pure nickel cast. » can be used on dry skin. » do not damage healthy skin. » do not get peeled off or wean out easily.